what3words is a global addressing system that provides a precise, yet very simple way to locate, share, and talk about any position/point on the face of the earth. what3words has divided the world into 57 trillion squares of 3 metres by 3 metres or 10 feet by 10 feet approximately, and has given each of these squares a unique address made up of 3 words. This means that with what3words, everyone and everywhere has an address. Crazy right? what3words provides the precision of GPS coordinates, but uses just 3 dictionary words to talk about an exact location. 3 word addresses are much easier to remember, use and share with others by phone, text or email. In comparison, is almost impossible to remember and communicate the 16 digits of a latitude-longitude, and errors are common when they are typed or read out. This past August NIPOST (Nigerian Postal Service) announced its adoption of the innovative global addressing system, what3words. Nigeria is the third country to adopt the module in Africa. what3words is already in use in more than 170 countries and by over 400 companies around the world. NIPOST is set to increase home delivery to 70 per cent within the next two years and 90 per cent by 2020 through it’s Mail for Every House Initiative (MEHI) and the integration of what3words will help it achieve this goal. This is good but that is not why I am excited. The great thing about what3words is that it is also being used by individuals via the free what3words app. This is great because Nigeria’s e-commerce stores like Konga or Jumia can easily start leveraging the what3words global addressing system. It would be as straight forward as asking their users to input their what3words address (which the users can easily obtain using their what3words app) during checkout, and then they pass it along to their delivery/courier partners. The courier will then input the what3words address into their what3words app and it will take him/her to that exact location. It will cost the e-commerce and logistic companies little or nothing to adopt what3words global addressing system. It will also save logistic firms a significant amount of time when they are out there delivering, because the address will be precise, right to the door of the customer. And it keeps getting better. In areas with poor internet connection the app works offline, without a data connection. 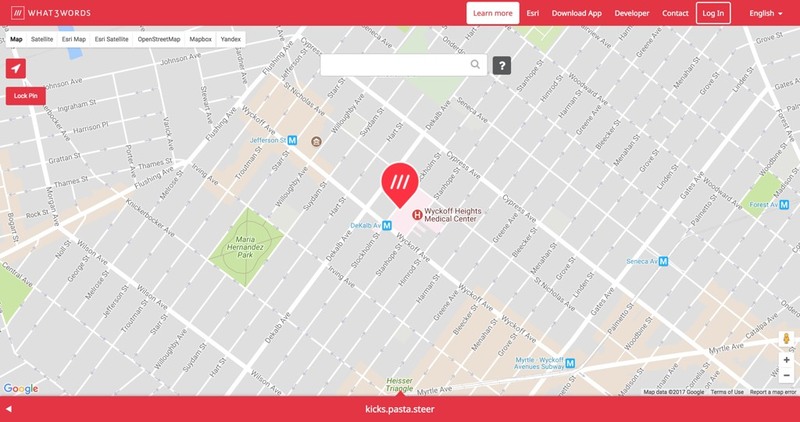 Once you have downloaded what3words app you don’t need to have a connection to see the 3 word address of where you are. The app will use your phone’s GPS to show this. So users can step out in front of their door and use the app to get the 3 word address of their exact location, their front door. How amazing! A country wide adoption of the what3words addressing system is going to boost the e-commerce and logistic sectors because the e-commerce stores and logistics companies will become more efficient. As a result they can afford to lower their price of delivery and in turn customers will become more keen to have things delivered to their homes or offices, in short they would trust the service more. It is a win-win for everyone. I don’t know about you but I am excited and eager to see where this leads, but at the same I sincerely hope that Nigeria (NIPOST) does not abandon their already existing postcode system, because even though what3words is amazingly precise the data does not belong to the Nigerian government. We should endeavor to build out our postcode system by first geographically mapping each and every postcode and storing the geo data. We must remember that what3words is a supplemental addressing system it is not a geospatial systems that is tailored to any particular country. We need to build our Basic Spacial Unit (BSU) in the form of our postcodes, because the benefits go far beyond an addressing system, it also has geo-marketing and socioeconomic benefits.